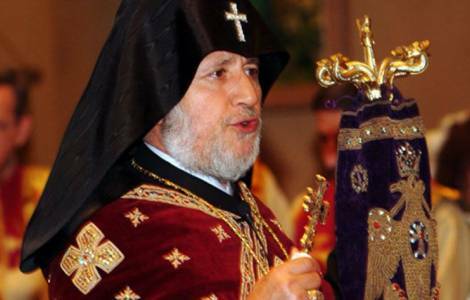 Erevan (Agenzia Fides) - The mobilization of groups of Armenian demonstrators who on July 6 entered the Patriarchal See of the Catholicosate of Echmiadzin to demand the resignation of Karekin II, Supreme Patriarch and Catholicos of all Armenians continues. The groups of protesters are still in the area of the Patriarchal See, where they have also set up some tents for overnight stays. The blatant form of protest is creating confusion, and is called "unacceptable" by priest Vahram Melikyan, at the head of the Patriarchate's communications office. Today, July 10 - according to Armenian media - the critical situation created around the Armenian Apostolic Patriarchate could be examined during a meeting of the Supreme Spiritual Council, urgently convened to take advantage of the presence, in Yerevan, of many Council members from the Diaspora, who in these days have come to Armenia to take part in the pan-Armenian youth meeting. The protests against Patriarch Karekin have gained strength due to the wave of political and social crisis that last May led to the exclusion of Prime Minister Serzh Sargsyan from power, replaced by the leader of the government of opposition leader Nikol Pashinyan. The Armenian protesters accuse Patriarch Karekin II of excessive closeness with the political apparatuses who were defeated by the political-institutional clash in the last few months.